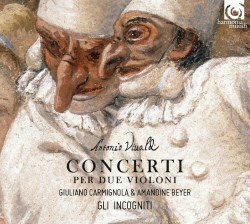 Gli Incogniti are another of those extraordinary groups for whom Vivaldi's virtuoso writing holds no terrors. With several successful recordings behind them, they cannot really lay claim to being 'The Unknown' any longer. For this issue they have employed the great Vivaldi specialist Giuliano Carmignola who, taught as he was by Nathan Milstein and Henryk Szeryng, knows a thing or two about virtuosity, to partner Gli Incogniti’s own leader, the remarkable baroque violinist Amandine Beyer. Listening to this disc was an amazing experience because we ordinary humans can’t do what they do. Charles Burney is quoted in the booklet reporting the singing of the girls of the Ospedale della Pietà, they “played a thousand tricks in singing, particularly in the duets, where there was a trial of skill and of natural powers, as who could go highest, lowest, swell a note the longest, or run divisions with the greatest rapidity”. This was, of course, some decades after Vivaldi’s death but his spirit clearly lived on for one only has to substitute 'playing the violin' for 'singing' and the concerti on this disc are summed up. Olivier Fourés, who writes the booklet essay, sets about describing how these six Concerti per due violini can be viewed as jousts between the soloists. The first few seconds of the opening concerto RV507 is for two violins alone and it certainly throws down the gauntlet and launches into battle. There are other unaccompanied duels elsewhere including in the allegro finale of the concerto RV513. I’ve mentioned before Stravinsky's famous quip about Vivaldi composing the same concerto multiple times and commented then how wrong that is. Despite having an embarrassing number of his concerti in my music collection I didn’t recognise any of these and they are utterly thrilling discoveries. They really do all sound like competitions in virtuosity and in equally wondrous lyricism. I do not exempt from this the single, and very short, Concerto Ripieno RV127, which is just as exciting to hear despite its 5 minute duration. We did not need this makeweight, available elsewhere, but I am glad it is here. The stereo recording is gorgeous with a real sense of a space around the players. It is only Red-Book CD but it responds well to a bit of surround processing, if you have the facilities. I am just a little sorry it isn’t a 5.0 SACD but it is available as a 24bit/88.2kHz 2.0 download for those wanting a bit more from the recording and prepared to pay 50% more money for a lot more data. This issue is to be bought immediately by all lovers of the Italian baroque!